Every three months or so, Tiger Woods grabs his favorite putter and retreats to his personal workshop. Like with any putter, the grip gradually shrinks over time, so he carefully peels off the old material and meticulously replaces it to his satisfaction. Even after all these years, nearly 18 of them now, there is no one else he trusts to oversee the process; there is no one else he trusts with the tool that has accompanied him during the most dominant era in golf. Woods has never actually given the putter a name. Bobby Jones called his Calamity Jane, Jack Nicklaus had White Fang. Woods' wand is only casually referred to as "The Scotty," an unsubtle reference to the distinctive brand. To call it one-of-a-kind is not an exaggeration. Woods doesn't own a backup. Throughout the years, putter-maker Scotty Cameron has produced more than 100 putters for Woods, but none could stand in for this one -- the world's most famous putter. "Nothing was exactly like this one," Woods insists. It is starting to show its age, flecked with tiny nicks and scrapes and dents across its face, the residual effects of clinking against other clubs or being slammed in anger against the heel of a golf shoe. That only adds to its lure. "I believe that putters have character," Cameron says. "Putters act up and putters are your friend. When you're in the trenches in a major, you have a relationship with your favorite club." After collecting dust at Woods' home for so many years, "The Scotty" is active once again. As Woods makes his season debut this week at Torrey Pines, he will be reunited with this trusty sidekick for the next chapter in one of the game's most iconic relationships. Woods and Cameron first met in the mid-1980s. There was no formal introduction. Instead, it was a regular occurrence by happenstance, as each was chasing every golfer's dream of improvement. Already a talented junior player, Woods would join his father, Earl, at the Navy Golf Course in Los Alamitos, California, just one town over from their family home. He would take lessons from head professional John Anselmo, who was also Cameron's instructor. "We had a common friend," Cameron tells ESPN.com. "I would see Tiger and got to know him." Within a few years, Woods solidified his teen phenom status. He won three straight U.S. Amateur Championship titles (1994-96), the last of which helped foreshadow his professional career. Trailing 5-down with 16 holes left in the 36-hole contest, Woods never relented. His 35-footer for birdie on the 35th hole was a highlight-reel moment. He sealed the victory with a short par putt on the second playoff hole to become the first player to win in three consecutive years. Woods made that comeback armed with a Scotty Cameron putter he had picked up along the way. Cameron's company had received its first big break three years earlier, in 1993, when Bernhard Langer won the second of his two Masters titles while wielding a Cameron putter. The following year, Cameron merged with Titleist, a partnership which still exists today; by 1995, his putters were already the No. 1 choice among PGA Tour professionals. All of that, though, was a precursor to the boom that was about to take place. In 1996, around the time of Woods' historic U.S. Amateur triumph, Cameron created his first putting studio in San Diego's North County. It would allow professionals the opportunity to show their putting strokes in a non-tournament environment and choose the best model for them. On occasion, Cameron would still make house calls. Five weeks after turning pro at the Greater Milwaukee Open with that "Hello, world" declaration, Woods was using the same Cameron putter he had used during the Amateur. Now, armed with a lucrative contract to play Titleist equipment, he was interested in exploring another option. Cameron already knew Woods was finicky about his tools, but quickly learned that the golfer owned an attention to detail that was unparalleled among his peers. "Tiger was always by far the most keen on feel and sound and weight," Cameron says. "He always had a say in the matter. Whenever I would work with him, I would learn. He was direct and to the point. He knew what he wanted, which is great." Cameron arrived at the Las Vegas Invitational with an arsenal of putters. Together, he and Woods produced a putter that immediately went into Woods' bag that week. Needing a victory to ensure his PGA Tour playing privileges for the next year and to avoid Q School, he defeated Davis Love III in a playoff to capture the title at TPC Summerlin. It was a monstrous win for Woods, but the exposure made it an even bigger win for his putter maker. When Cameron's first daughter was born soon after, he and wife Kathy picked a name that in part honored the milestone: Summer Lynne. 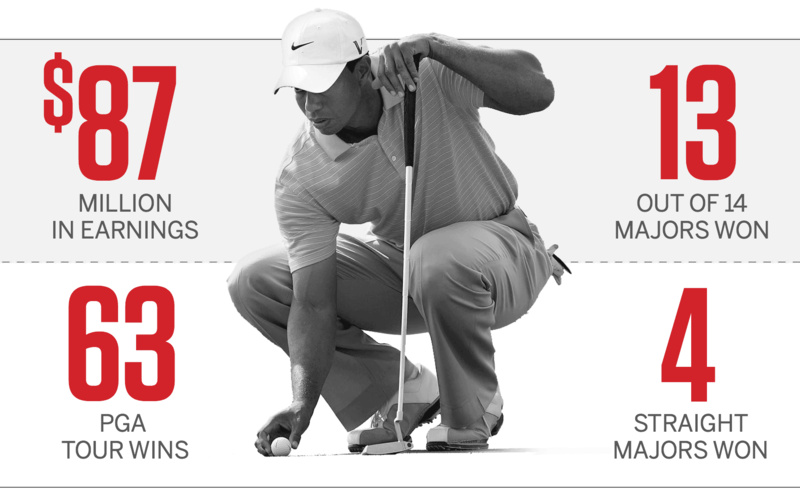 A look at Tiger Woods' putting averages during a decade span on the PGA Tour, which shows an advantage with "The Scotty" putter. Woods also ranked top 10 or better in putting in five out of eight seasons on the tour (2000-07). From 2010 to 2015, Woods averaged fewer than 15 PGA Tour starts, mainly due to health reasons. During that offseason, Woods visited his old friend in the new San Diego putting studio. They settled on a Teryllium TeI3 model that Woods would famously use while lapping the field at the next year's Masters, launching a new era in golf that revolved around this 21-year-old wunderkind. Woods was inspired, not just by the putter, but the studio itself. He soon purchased a condo in the posh Isleworth community of Orlando, Florida, where friend and mentor Mark O'Meara already owned a beautiful house. Of all the amenities in O'Meara's home, it was his personal golf workshop that most interested Woods. "Tiger wanted a shop that was cooler than Mark's," Cameron recalls. "He loved my little factory. He said, 'Scotty, can you help me put together my garage?'" They soon purchased enough machinery to fill Woods' garage, spacing them out in a U-shape so he could still park his car. Shortly after that, Woods approached Cameron seeking some help with his workshop. "I went to work on some stuff," Woods told him. "It's dead, it won't turn on." He gave Cameron the proper codes and clearance to get into the property. When he showed up later that day, he found Hughes Norton, Woods' initial manager when he turned pro, on the phone in the kitchen holding a Wheaties box. Norton hung up the phone and explained to Cameron that he just brokered a deal to have his client's likeness appear on the famous front of the cereal box. He asked Cameron why he was there. When the putter maker explained that Woods had complained about his workshop issues, Norton just started laughing. "I turned the breaker off," he told him. "Scotty, do you know how much his hands are worth? He's not getting his hands on that machinery." During the early months of the 1999 campaign, Woods' putting stroke suddenly and confusingly abandoned him. Only two years removed from his historic Masters victory, he finished in a share of 18th place at Augusta National, but needed the second-most putts of any player in the field. While he won the Buick Invitational and finished in the top five at five other tournaments, those results didn't reach the lofty bar he always set for himself. Entering the Byron Nelson Classic in mid-May, Woods had broken 70 just once in his previous 17 rounds. The problem was no secret: He ranked 102nd on the PGA Tour in putting average to that point and his 29.69 putts per round placed him 162nd out of 188 ranked players. Woods called Cameron and asked him to make a new putter. Their discussions were peppered with intricate details. Woods wanted one that was more square and more angular. He was fastidious about it, down to the smallest details. "I was involved a lot when it was originally made," Woods told ESPN.com this week. "I moved the sweet spot to the exact center." On Monday of tournament week, Cameron crafted a Newport 2 model just for Woods, carefully measuring each possible aspect. "When you send it out to me on Tour, make sure it's exactly what we talked about," Woods told him, "because I don't want to second guess you." With the FedEx truck literally waiting by the delivery entrance to his studio, Cameron weighed the putter a final time. He found it was too heavy by two swing-weight points -- the equivalent of two dollar bills -- and knew Woods would be able to tell the difference. Under the gun to finish, Cameron milled a small dot into the back of the putter head, which made it one swing-weight point lighter. Needing to lose one more point, he put another hole in the face heel to counterbalance the first one. The putter was now at the exact weight Woods wanted, but it still wasn't complete. Using a quick-drying machinist ink called Dykem, he filled in those dots with a red marking. Cameron remembered going to the racetrack with his father as a young boy and seeing a certain model of car with red dots on its hood often win. He liked the idea of using that on his putters -- and Woods was a pretty big fan of the color, too. Cameron finished the putter, packaged it and sent it off. Three days later, Woods posted an opening-round 61 -- still tied for the lowest score of his professional career -- en route to a seventh-place finish. Then and to this day, many believed he would have used that same putter for years afterward. Not exactly. Cameron had been researching the world's best stainless steel and soon found it in Germany, where he purchased a few bars of an expensive, silver-plated alloy and then produced another putter with the same specs, same weight and same red dots. This putter would be the one to make history. Maybe Woods could have rewritten the record books with another putter in his bag. Maybe he still could have made history while using a garden rake on the greens. Or maybe the Cameron putter was his key to success all along. Even now, the numbers look like too-good-to-be-true facts about a mythical golfer from some fictional storybook. But they're real, and they're spectacular. Following his appearance at the Byron Nelson in 1999, Woods wielded the same exact putter for more than 11 full years. During that span, he won 63 titles on the PGA Tour alone. He cashed more than $87 million in total earnings. He claimed 13 major championships. And for as much as Woods' ever-evolving swing was analyzed and adored, glorified and criticized, his putting remained the one constant. He might not be the most gifted putter the game has ever seen (arguments can be made for Bobby Locke and Ben Crenshaw), but he's undoubtedly the best when it has mattered the most. Woods recently insisted the best pressure putt of his career occurred at the 2000 PGA Championship. Trying to win a third consecutive major and knowing he needed to make a 7-foot downhill slider to force a playoff against Bob May, Woods found the center of the cup, later taking the title in an epic duel. Perhaps his most memorable putt -- for the television viewing audience, at least -- wasn't even officially considered a putt, since his ball was resting on the back fringe of TPC-Sawgrass' famed 17th hole peninsula green during the 2001 Players Championship. As it snaked toward the hole, NBC commentator Gary Koch promised, "Better than most ...," then repeated himself twice more before the ball disappeared into the hole amid a thunderous roar from the gallery. But if there was one putt that epitomized Woods' ability in the clutch, it came on the final hole of regulation at the 2008 U.S. Open at Torrey Pines. Needing a 15-footer to force a playoff against Rocco Mediate, he willed the ball into the hole, as if there was no other potential outcome. Earlier that year, right in front of Arnold Palmer, who was watching near the final hole at Bay Hill, Woods drained a 35-foot birdie, slamming his hat in celebration while still clutching that magical putter. "I have to say it's [the ultimate feeling] knowing that you have an opportunity to end the tournament and it's in your hands -- not anyone else's -- it's in your hands," Woods would later explain. "It's like having the ball with a few seconds to go. Do you want it or not want it? I would much rather have it in my hands than anyone else's." 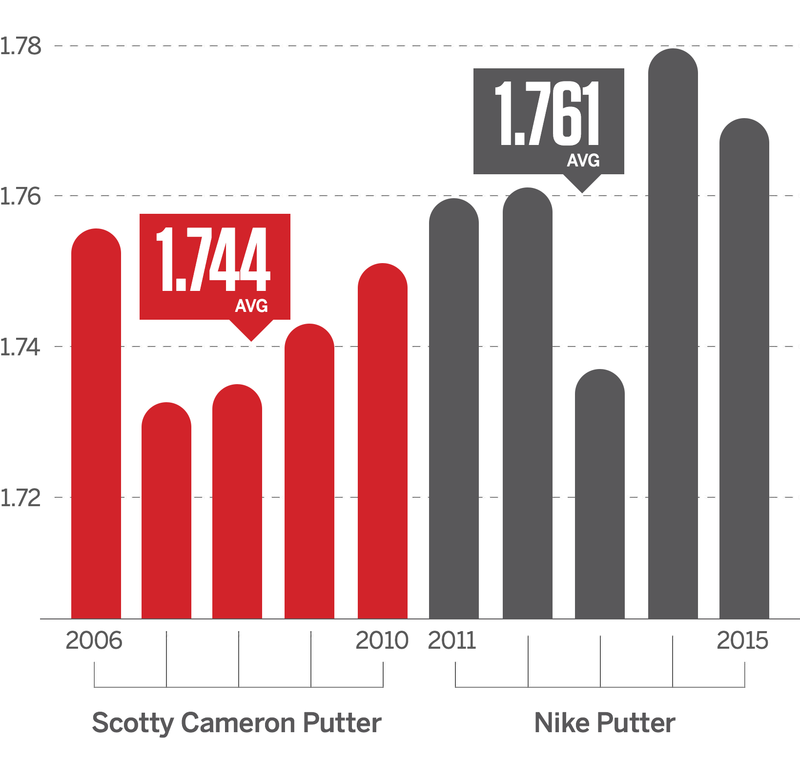 Some numbers from Wood's résumé once the Scotty Cameron putter was put into play, from the 1999 Byron Nelson through the 2010 Open Championship (ESPN Research). Just because Woods used the same putter for so many years doesn't mean there weren't numerous modifications to it. Sometimes he'd send it to Cameron for routine maintenance. It was such a casual occurrence that one time Woods shipped the world's most famous putter from his home in Orlando in a triangular FedEx tube, failing to even tape down the edges. When it would arrive in San Diego, there was a little more commotion than usual. Cameron's coworkers would take a few longing glances; his daughters would each give it a kiss for luck; he would even talk to it. "I'd give it some words of encouragement," Cameron admits with a laugh. Other times, though, Woods would summon for him as a direct correlation to a specific incident. Cameron vividly remembers one of these occasions from years ago. He was in his putting studio, watching Woods on television at Torrey Pines, when he saw Woods' reaction after a missed putt. "He hit it against the bottom of his bag," Cameron recalls. "I turned to one of my coworkers and said, 'That's going to need some work.'" Within a few hours, Woods called the office. "How bad is it?" Cameron asked. "Man," replied Woods, "it's a mess." Unlike other events, Cameron was in the same city, so he was available to fix it up. He had planned, however, to take his wife and young daughter to a Harlem Globetrotters game that night and didn't want to disappoint them. He decided he could do both. Cameron bolted down a loft-and-lie machine to the bed of his truck. His family in tow, he drove to Woods' hotel, picked up the putter and parked in an underground garage. By this time, it was already dark outside, so he enlisted his daughter to hold a flashlight while he re-adjusted and straightened out the neck of the putter. Once he was positive it was to his and Woods' satisfaction, he returned the putter inside the hotel and then went to the game. "No matter where he was, I was always there to help," Cameron says. "I think there was friendship, but also trust. He knew I was there for him." Woods went on to win the tournament that week. On July 15, 2010, Woods played a competitive round without a Scotty Cameron putter for the first time in his professional career. It was The Open Championship on the Old Course at St. Andrews, a site he had gotten to know intimately during flawless victories five and 10 years earlier. There was little reason to question his hypothesis when he announced he would be employing a new Nike Method model that week. "I've always been tempted to change my putter on slower greens," he explained before the opening round. "I've always struggled when greens are really slow. ... I've always had a hard time. I've always experimented with other putters throughout the years, but I've never put one in play until now." The result wasn't encouraging. Woods endured 10 three-putts through the first three rounds of the tournament, switching back to the Scotty model for the final round before finishing in a share of 23rd place. He continued to use the old putter for most of that year, but by the time the next major rolled around at the 2011 Masters, he was fully committed to the Nike version. Of course, putting was hardly his most glaring issue at the time. Three months after Woods parlayed a 54-hole lead at the 2009 PGA Championship into a loss at the hands of Y.E. Yang, a car accident in front of his Orlando home launched a domino effect that led to the revelation of his infamous personal scandal. After a four-month leave of absence from competition, he resumed a normal playing schedule. Many sponsors jumped ship, but Nike, the company with which he had been synonymous for so long, stayed with Woods. It led to speculation that when Nike introduced its first line of putters, there was a quid-pro-quo situation -- they did him a favor, and now they needed one in return. Woods kept the Nike model in his bag for most of six years -- that is, when he was healthy enough to play. Upon his return from a 16-month injury hiatus at last month's Hero World Challenge, he only fueled that prior speculation. For the first time in more than a half-decade, Woods once again had the Scotty Cameron putter in his bag. When asked when he decided to make that switch, he answered, "The day that we were no longer a part of the hard goods side." Woods never called Cameron to let him know the old putter was back in the bag. Instead, Cameron found out when he was in Japan prior to the Hero and saw Adam Scott, who recently played with Woods and let him in on the secret. Not that Cameron believes he owes him a call. "I'm just thrilled to have him back," Cameron says. They have yet to speak since Woods started using the putter again, but he's looking forward to that moment. "We're here to help. Hopefully soon, I'll be able to touch base with him. I'm wide open." Cameron owns a keen understanding of how much this putter has meant to Woods, because he also knows how much Woods has meant to his brand of putters. "There's some karma to that putter," he says. "It's special." His son, Charlie, will turn 8 in a few weeks. Woods says he has already been bitten by the golf bug and, like any golfer, is intrigued by his dad's collection of putters in his personal studio. Charlie has free reign to experiment with any of them -- except the ones which won majors. "Charlie knows there are two putters he can't touch," Woods said last month. "There's that black one I won with the Teryllium insert, I won the Masters in '97, and this one. They sit next to each other. Touch any other putter, do anything you want with any other putter. These putters are off limits. These two, Daddy only." He smiles when he recalls this story, just as he smiles when asked to describe the feeling of having the Scotty back in his bag. "You can find other putters," Woods says. "You might put it on the side, or in the penalty box for a little bit. But for some reason, it just keeps coming back."